Definition at line 32 of file CEvaluationNodeConstant.h. Definition at line 38 of file CEvaluationNodeConstant.h. Definition at line 28 of file CEvaluationNodeConstant.cpp. Definition at line 32 of file CEvaluationNodeConstant.cpp. References _INFINITY, _NaN, EXPONENTIALE, FALSE, CEvaluationNode::mPrecedence, CEvaluationNode::mValue, PI, PRECEDENCE_NUMBER, and TRUE. 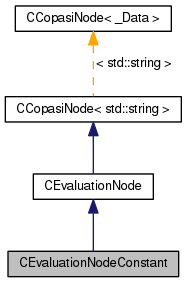 Definition at line 70 of file CEvaluationNodeConstant.cpp. Definition at line 74 of file CEvaluationNodeConstant.cpp. Definition at line 180 of file CEvaluationNodeConstant.cpp. References CEvaluationNodeConstant(), EXPONENTIALE, FALSE, INVALID, PI, CEvaluationNode::subType(), and TRUE. Retrieve the display string of the node and its eventual child nodes. in Berkeley Madonna format. Definition at line 118 of file CEvaluationNodeConstant.cpp. References _INFINITY, _NaN, EXPONENTIALE, FALSE, CEvaluationNode::getType(), CEvaluationNode::mValue, PI, CEvaluationNode::subType(), and TRUE. Retrieve the display string of the node and its eventual child nodes. in C format. Definition at line 77 of file CEvaluationNodeConstant.cpp. References _INFINITY, _NaN, EXPONENTIALE, FALSE, CEvaluationNode::getType(), PI, CEvaluationNode::subType(), and TRUE. Definition at line 273 of file CEvaluationNodeConstant.cpp. Retrieve the display string of the node and its eventual child nodes. in XPPAUT format. Definition at line 149 of file CEvaluationNodeConstant.cpp. Definition at line 219 of file CEvaluationNodeConstant.cpp. 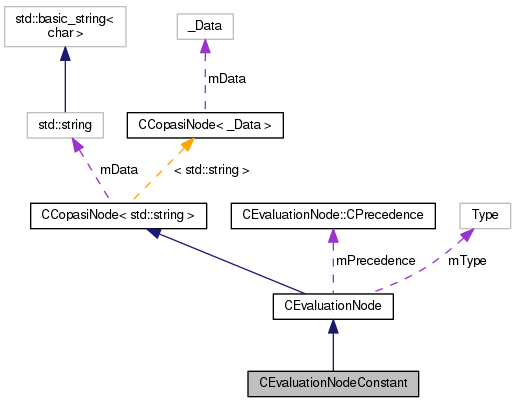 References FALSE, CEvaluationNode::mType, CEvaluationNode::subType(), and TRUE. Create a new ASTNode corresponding to this ConstantNode. Definition at line 232 of file CEvaluationNodeConstant.cpp. References _INFINITY, _NaN, EXPONENTIALE, FALSE, CEvaluationNode::getType(), INVALID, PI, CEvaluationNode::subType(), and TRUE.